This is a summary for Brinley for 13.5-14 months old. This two week period was really quite uneventful. She was happy and mild-mannered. Eating was great. She has started to make progress on the throwing food on the floor front. She seems to think that when she is done that she needs to clear her place of food. Maybe that sounds nice, but not when there is a pile of food under her on the floor (I actually call this her food storage. If I don’t sweep it up right away, she will return later for a snack…). I talked about this last time how it was improving and I can see her having cognitive decisions to not do it. She will grab it and just about throw it, then shake her head no and put it back on the counter. But she really wants that spot cleaned up, so she is happiest if I take it from her. Play time is going well! Nothing new or different to report. Sleeping is also going well. We are now at the age that I have predicted Brinley would drop down to one nap a day–I figured she would do it sometime as a 14 month old based on the timeline of her signs. So we will see if that comes true this month (I won’t force it true if she isn’t ready 😉 ). Toward the end of this time period, a couple of naps were sketchy, but I am not sure if it is teething or a sign that she is ready for one nap. Brinley cut two teeth during this two week period. One central incisor and one lateral incisor (both upper). Brinley is not walking yet. She does get furiously mad if anyone tries to get her to walk. She has the strength, just not the desire. Kaitlyn and McKenna were both older walkers. Kaitlyn was 15 months and McKenna was 17 months. I don’t mind it. 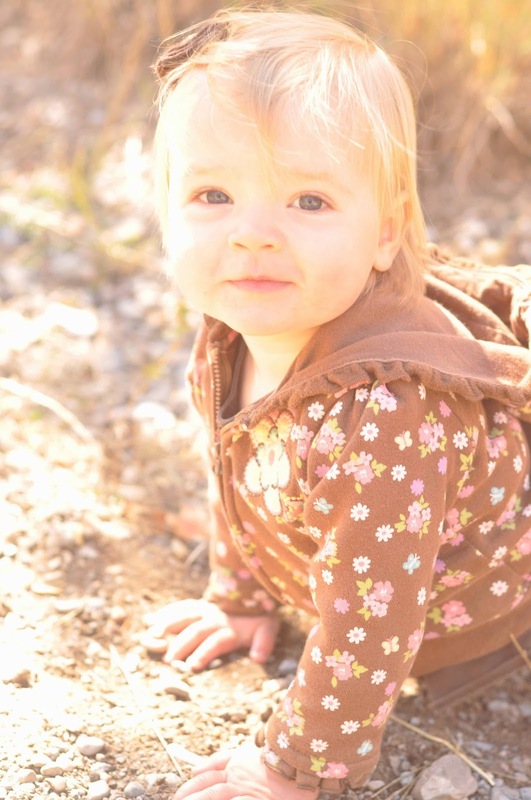 The only down side is that knees get dirty (but Brinley will actually crawl on her feet and palms when she is out side–basically in a walking “down dog”–impressive huh?). A crawler is happier to be carried when in public. I don’t think she necessarily gets into less than she will when she can walk–she can stand up anywhere and get into things just fine. She is slower as a crawler than she will be as a walker. Something I like with the later walkers is the accidents are much less frequent. They have such good balance by the time they walk that they rarely fall.